Successfully Added Vapor Storm V80 Box Mod Kit - Adjustable Temperature, Air Flow Control, 7 To 80 Wattage, 0.2-Ohms, 4.50ml Tank, 510 Thread to your Shopping Cart. 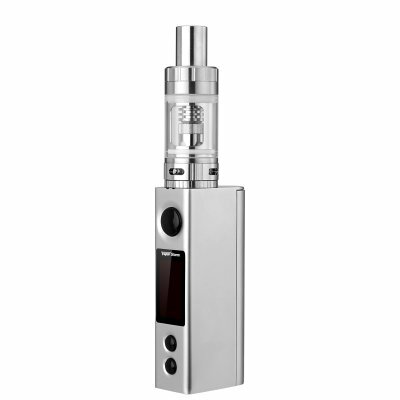 Take your vaping experience to the next level wit the Vapor Storm V80 electronic cigarette. Having an adjustable wattage that ranges from 7W to 80W, this astonishing vapor mod kit brings along plenty of vaping opportunities for both the starting and advanced vapers out there. Crafted out of a durable zinc alloy, this vapor holds a stylish and high-quality design. Its sleek body fits perfectly in your hand, providing you for a comfortable grip while enjoying your upcoming vaping sessions. Simply pour in your favorite flavor of vape liquid and you’ll be all set to enjoy your vapor to its absolute most. Holding a large 4.5ml top filling tank, the Vapor Storm V80 box mod kit allows you to fill it up with plenty of juice. Although this vapor might feature a slightly larger size than other models out there, it is still highly portable. Simply slide it in your pocket or purse and this electronic cigarette will follow you wherever you go, allowing you to engage in a relaxing and tasteful vaping session at any given moment. Supporting up to 0.2-ohm, this E-cigarette is capable of handling all the necessary Wattage for you to fully enjoy the flavors while vaping and, simultaneously, allows you to create exceptionally large vapor clouds that are sure to grab the attention of all your friends and people passing by. With its adjustable temperature control feature, you’ll be able to set the temperature of your own liking ranging from 100 degree Celsius up to 315 degree Celsius. Supporting different power modes, this E-cigarette is capable of holding a wide range or coils, truly letting you customize your vapor based upon your personal style. Added to that, the Vapor Storm V80 electronic cigarette also features air flow control that lets you further increase your experience by letting you adjust your vaping style exactly to your liking. Intergraded within its sleek body, the Vapor Storm V80 electronic cigarette holds a sophisticated LED display that keeps you constantly up to date about your vapor’s current settings. With its three large buttons, this electronic cigarette is easy to operate and allows you to efficiently adjust the temperature, wattage, and a whole lot more with the simple touch of a finger. Simply assemble all parts, pour in your favorite liquid, and you’ll be all set to enjoy hours worth of vaping. With its easy to operate design and great specs, this E-cigarette is the perfect vape mod kit for beginners and advanced vapors alike. The Vapor Storm V80 box mod kit comes with a 12 months warranty, brought to you by the leader in electronic cigarettes as well as wholesale electronic gadgets..